A peregrine falcon has laid eggs in a new nest box on a water tower while maintenance work was being carried out. 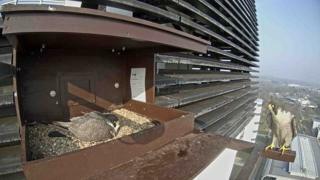 A pair of birds has produced three eggs at the nest at BT's Adastral Park site at Martlesham, Suffolk. The male wintered at the park and he was joined by a female in January. Experts set up a the box to tempt the pair to stay and breed and it worked. BT is delighted and, along with falcon experts, staff are looking forward to seeing chicks hatch in May. A monitoring camera has been set up by the Hawk and Owl Trust to keep a close watch on progress. "Based on observations from the last six years it was expected the pair would move on from Adastral around February," said Peter Merchant, peregrine expert at the trust. "We decided to try and tempt them to stay by providing a nesting site and it worked. "We must be cautiously optimistic about success, being mindful that peregrine falcons are notoriously unpredictable as parents." The last egg was laid on 5 April and if the eggs prove to be fertile, they are expected to hatch early in May. "It's so amazing these eggs were laid just a few yards from where work was going on commissioning the site's air conditioning units on top of the tower," said Mr Merchant. Lisa Perkins, Adastral Park Director, said: "It's fantastic to have these amazing birds living with us. "We can't wait to see how this new family progresses and I'm so pleased we are able to keep an 'invisible' close eye on them via the camera."